I have yet to blog about the adventures of almost two weeks ago as I ran around the magical world of Disney. Though I am somewhat (OK, extremely) heartbroken that I was shot down in the very first round by the Disney Moms Panel for the runDisney spot (seriously, don’t they know that I am way too competitive for that kind of rejection? 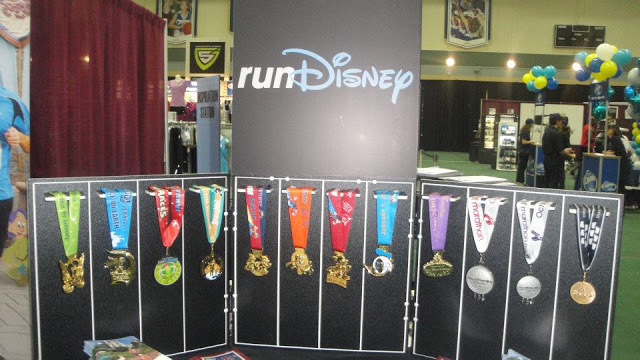 ), I can’t hold a grudge for too long when it comes to that Mouse and his race medals. So as many of you know, my family took a trip to Walt Disney World during the last week of September. On, oh, I’d say day #2, my sister Holly and I were driving to get some food when I read an email on my phone from the almighty runDisney PR guy-in-charge himself, Bob Hitchcock. 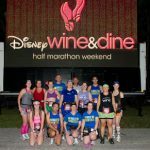 I was informed that the Wine and Dine half marathon weekend Meet-up and Eat-up special event that I found out about, oh, 5 hours after it was opened for RSVP’s (and full about 2 minutes after) a week earlier, but I emailed with my info anyway, complete with a prayer and some pixie dust, had a cancellation, and I was in (did you follow that run-on sentence?). Holly laughed as I jumped up and down in the car. I was SO EXCITED. So 5 days in the happiest place on earth passed and Friday morning I met up BRIGHT and EARLY with a bunch of other runDisney fans at the ESPN Wide World of Sports Complex (after getting thoroughly lost trying to drive there, haha) After a brief intro from Bob, we were whisked away on golf carts to the track for the beginning of our session. 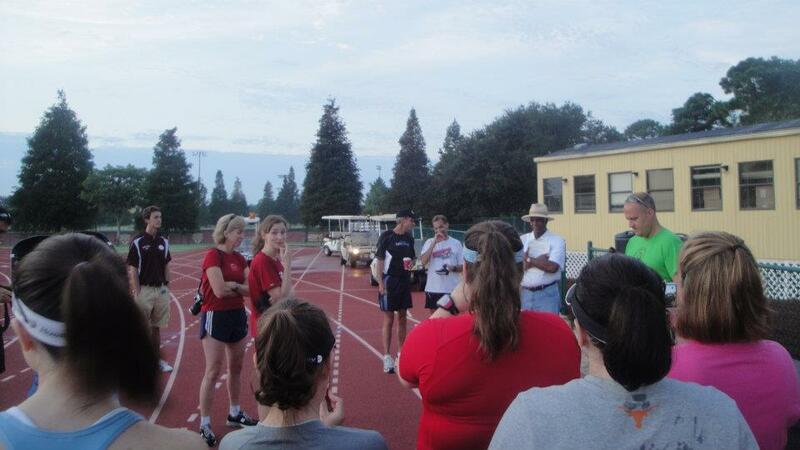 To start, we met Olympic Track and Field coach Brooks Johnson. This guy was a trip. Super funny, and incredibly knowledgeable. It is very interesting for me to to listen to the pros in this field, as often times things I’ve been taught seem to contradict the things that seem to actually work. Not so much the case with Mr. Johnson, however, as he handed out multiple pages of notes to all of us on the biomechanics of running. I was in Exercise Science nerd heaven. 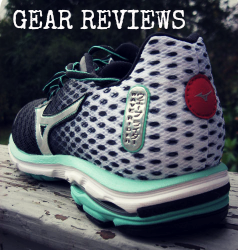 And the highlight, for me, was Mr. Johnson’s firm stance on the fact that strong feet create a strong body, and that all of these over cushioned, over supportive shoes on the market these days are the root of all running pain evil. I couldn’t agree more. 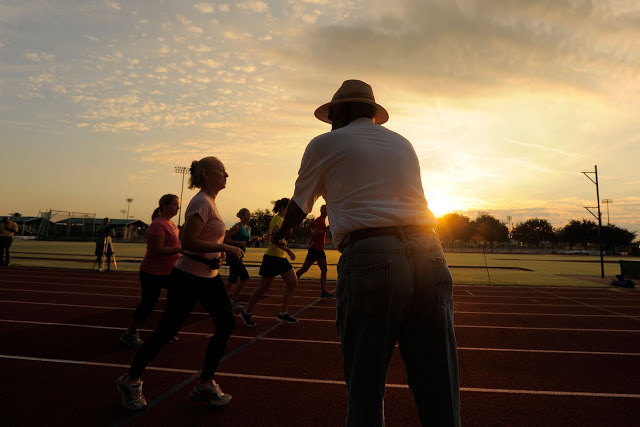 He next stood us up and put us through a few different drills on the track, demonstrating how things such as arm movement could have a significant impact on our speed and technique. 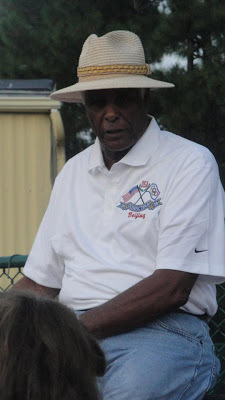 I felt like I was in high school track again, and could almost hear Coach Perry in my ear yelling “Heathaahhh, relax your shouldaahs!” (any HHS alum out there?) but instead I got an “excellent form” rating from Coach Brooks. Wooo! Next up, we met the 2010 Wine and Dine half marathon women’s and men’s overall winners, Melissa Wisner and Anton Van Zyl. They were really down to earth which was really great to see. Not that they wouldn’t be, but I know I tend to hold these super fast runners up on a pedestal sometimes. When in reality, they are just your average Joes….with darn good genetics and training discipline. 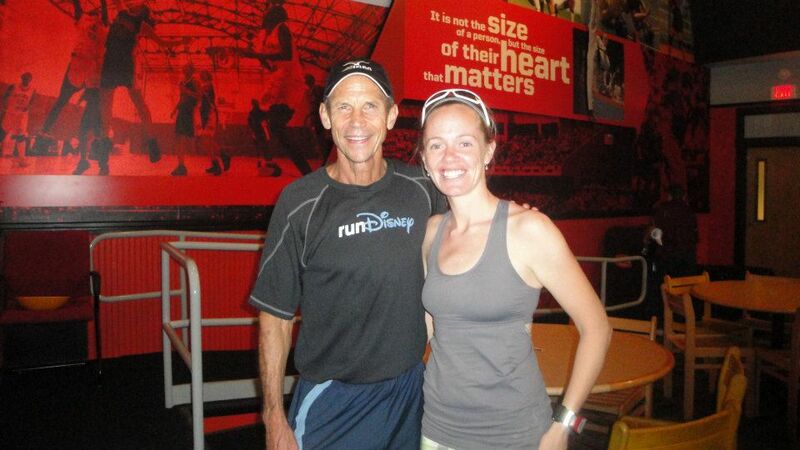 And then, came my friend and yours, Jeff Galloway, runDisney’s official training consultant. If you’ve been around here for a while, you know that way back, I denounced the Galloway method for my own training, because a walk break messes with my head. 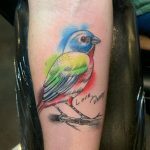 But besides my own insanity, I’ve got to say, Jeff Galloway is fantastic. Not only does he clearly know what he is talking about, but he is one of the most supportive, genuinely nicest guys I have ever met. This was my third Mr. Galloway meeting, and each time he is as friendly as the time before. 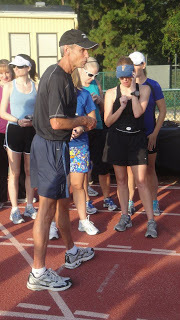 Anyway, he spent some time talking to us about training, a lot about eating before a night race (apparently the 2010 race was a bit of a barf-fest, lots of people are unaccustomed to racing at night), and answered questions. 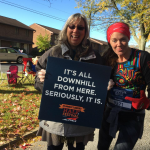 And then…we ran. 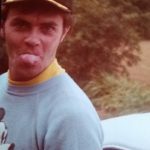 And as much as I do love Jeff Galloway, I couldn’t do the Galloway method that day (or, as DisneyDeborah says, I couldn’t “Jeff”. It’s a verb. As in, I Jeffed, he was Jeffing, let’s Jeff together.) 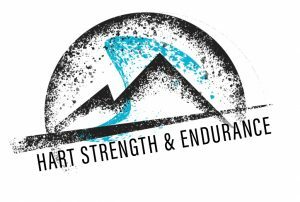 So instead, I chose to run the just shy of 2 mile trail run behind the ESPN WWS complex with Melissa Wisner and Anton Van Zyl, (and race director Jon Hughes) and prayed they weren’t going to run at race winning speeds. Luckily they did not, and instead, provided great conversation and company! 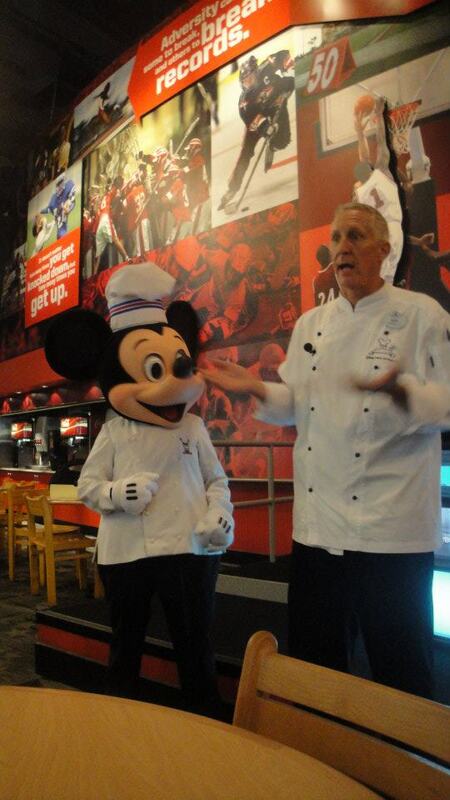 Last but not least, we were brought indoors for some nutrition and cooking tips from the always awesome Disney Chef (and Ironman) Gary Jones. 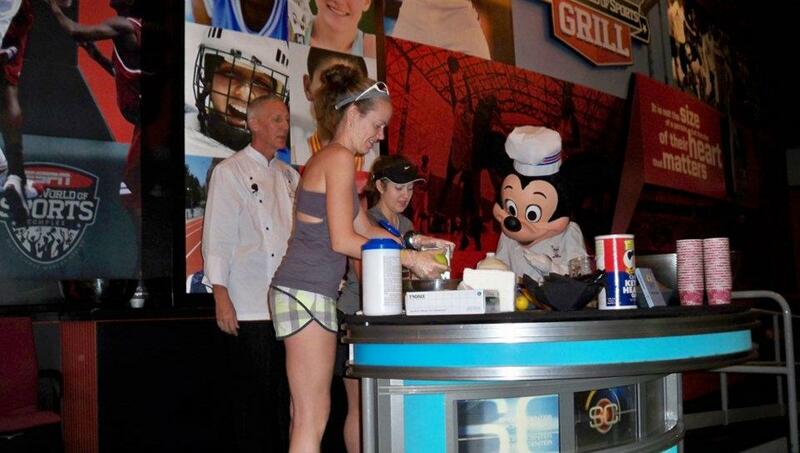 If you remember, Chef Gary was kind enough to let me attempt to ruin our snack during the princess half marathon meetup (I’m horrible in the kitchen) and called me up for a repeat offense, haha! This morning, we were making quinoa bircheruesli (don’t worry, I can’t pronounce it either, but I assure you it’s delicious…see recipe at the very bottom of this post) and I was in charge of apple and pear grating once again. Once again, with Chef Gary’s supervision, I managed to not destroy the dish. After the cooking was finished, everyone enjoyed the snacks that I slaved over cooking for them (I kid, I kid), while we were given a little insider info on the future of runDisney. 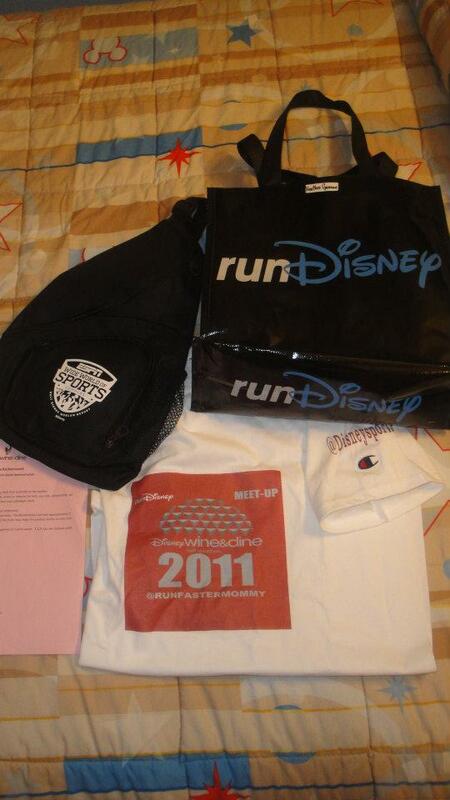 Apparently, while nothing is set in stone, there are ideas of an international runDisney event coming in the future. I don’t know about you, but that makes me want to get my passport, ASAP. Mr. Jeff Galloway and myself. He is just amazing! the goods! Check out that custom twitter handle “RunFasterMommy” t-shirt! the Bling I drooled over at the expo. I’ll take one of each, please and thank you, runDisney. 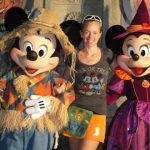 To learn more about & to join me at future runDisney races, be sure to follow their fan page on facebook, or follow them on twitter at @DisneySports. 1. Place the cooked quinoa into a 2 qt. bowl. 2. Add the dried cranberries and the chopped nuts. Mix. 3. Squeeze and juice the lemon into the bowl and mix. 4. Shred the apples and pear and stir into the mixture. 5. Add the brown sugar and mix. 6. Taste and adjust to your own preference. Instead of whole milk, you may use buttermilk, whole or reduced fat milk, soy milk, almond milk, oat milk, goat milk, lactaid, rice milk, or other to meet your individual needs. You may also use Kefir instead of yogurt. The choice of dried fruits and nuts is totally your preference. Each iten can be modified to suit your individual taste. The Birchermuesli will last approximately 2 days in the refrigerator after which oxidation of the fruits may make the product darker in color and less visually appealing. Quinoa is a grain that is cooked like rice, 1 part quinoa to 2 parts water. 1 1/3 cup raw quinoa yields approximately 4 cups or a 1:3 ratio. There’s something special about the air down there … pixie-dust and all! Cute top where did you get it? Fun! I was one of the many unlucky ones who was stuck in a work meeting when the blog post about the meetup came out. (Maybe I’ll get lucky next time…) Glad you had a good time. It looks like it was a blast!! jealous.. looks like a super fun time though! You were a super grater!! 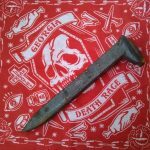 I, too, can’t stop writing and sharing about the Meet Up. Hope to meet YOU at the next! This looks like so much fun!!! I’m so happy your got into the meet-up!!! Sounds like you had a wonderful time. I have a client who I advised to follow the Galloway method of running. It seems to be working for her and she actually likes. I know it’s not for everyone, but for some it works. I want to run Disney! Have fun. Awesome! I SO enjoyed this post! 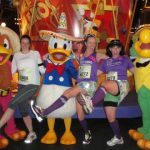 I am running the Goofy in 2012, which will be my first RunDisney event and after reading this, I am super excited!! Yay! Sounds like a great event. And as your annoying State Department PSA friend, my advice is to apply now for a passport if you think you’ll need it. Processing takes at least 4-6 weeks, and they’re good for 10 years. This is AWESOME! 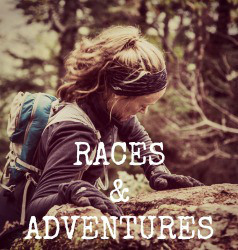 I totally want to do this at one of the upcoming Disney races!! Now unlike you, I’d be so excited to Jeff with Jeff! I JUST started his method and PR’d my first time using it at a race. I was sooo skeptical, but I’m also not fast, so in the end he seems to work for me — I just have to keep the ego in check when I start the first rounds of walking. It is a mild blow I’ll admit, but in the end it is worth it! That’s so funny that you were the food person Both times! You’ll be Chef Faster Mommy before too long! Hi Heather, so I’ve been reading your blog recently and kept thinking you looked familiar…well I just figured it out! I was at the W&D Meet Up too! I was looking at some of my pictures from the trip this weekend and there you were! 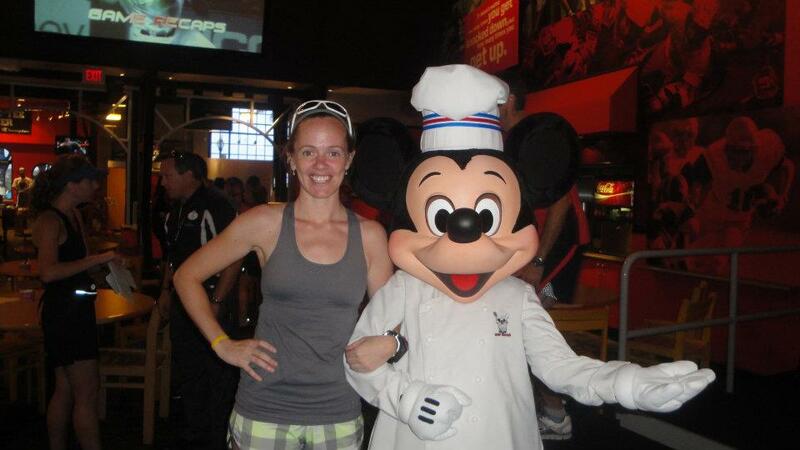 Hopefully we’ll cross paths again at another Disney race! I’ve been reading your blog and kept thinking you looked familiar and I just figured it out – I was at the W&D Meet Up too! I was looking through some of my pictures today and there you were! 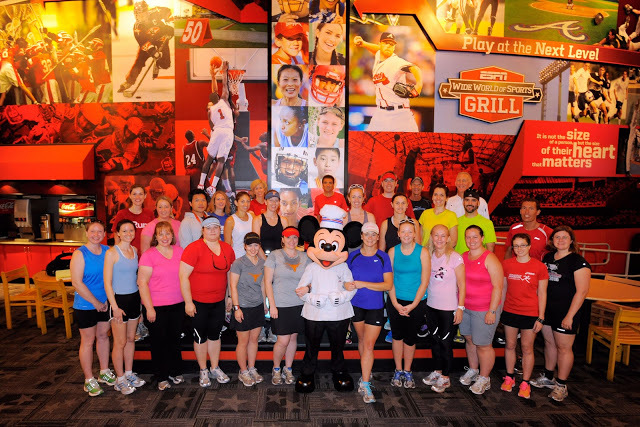 Hopefully our paths will across again at another Disney race!